Swiss Army Man is a well-acted, disgusting, poignant filmic oddity that will be too strange for the squeamish and an absolute treasure for intrepid, open-minded moviegoers. For the most intrepid film geeks, uncategorizable movies are almost always a can’t-fail affair. If a film’s ambition and imagination are so singular and strange that it’s beyond compare, stumbles in storytelling, bad acting, and even poor direction can often be overlooked for the simple fact that, good or bad, the film is showing us something we’ve never ever seen before. The delightfully demented Swiss Army Man is such a movie. But get this: the acting, direction, set design, cinematography, lighting–the nuts and bolts of the thing–are genuinely inspired and well-executed, which makes the Dan Kwan and Daniel Scheinert-directed filmic oddity an extremely well-polished diamond in the rough. The directing duo, quirkily billed as “Daniels,” have a storytelling style that throws conventional rules out the window while using technical proficiency (they’re known for making slick TV adverts) to wrangle the absurdity a bit and lends the film a bit of consistency. It’s a sort of fantastical, anything-goes rubric whose fruits are on full display in Swiss Army Man’s unforgettably weird and whimsical opening scene. Humming a lilting tune, we meet Hank (Paul Dano), a seemingly long-time castaway on a tiny island, his long, scraggly beard obscuring the noose he’s just looped around his neck. He’s a moment away from bidding the world farewell when his pity party is unceremoniously crashed by an extraordinarily flatulent corpse (Daniel Radcliffe) that’s just washed ashore. Before long, Hank is riding his dead friend like a jet ski across the ocean to the mainland, propelled by, well, the pale-skinned stiff’s big, unbelievably powerful farts. If at this point you’re not onboard with the artistic wave Daniels’ are asking you to ride, Swiss Army Man likely isn’t for you; if the sight of two Hollywood actors having a gassy meet-cute in the middle of a big blue sea though makes you want to wet your pants with excitement, you’re in for a treat. The strangeness doesn’t let up for the rest of the movie, not for one bit. The key to getting the most out of Swiss Army Man is to meet Daniels halfway and surrender yourself unconditionally to the absurdity that ensues. The plot makes no sense, but the plot isn’t the going concern; the film’s beauty lies in its emotions, imagery, and performances. After the dripping-wet duo hits land, Hank begins to take a liking to the corpse and names him Manny. Suddenly, Manny begins to speak! He can’t move anything but his mouth and eyeballs, but Hank’s just happy to have someone to talk to. He hoists Manny onto his back, and they travel through the teeming forests in search of signs of human life (or, at the very least, some scurrying critters they can chomp on for sustenance). Manny can’t remember anything about his life, so he bombards Hank with an endless deluge of questions about his body, friendship, love and other existential things, like why it’s unacceptable to fart in front of other people. His naiveté is adorable. From here, the film gets surprisingly complex, emotionally, with Manny and Hank’s relationship blossoming into something out of a fairytale (a very, very twisted fairy tale, but enchanting nonetheless). To Hank’s surprise, Manny’s floppy carcass proves to be a most useful survival tool; by contorting and manipulating his body in different ways, Manny can act as a wood chopper, water fountain, compass, underwater breathing device, or even a handy fire starter. Above all other functions, his big smile and open heart give Hank more comfort and companionship than he’s ever known. What makes the film gel is the oh-so-right chemistry between Radcliffe and Dano, two actors who have proven in their previous roles to share a sense of artistic curiosity and experimentation. 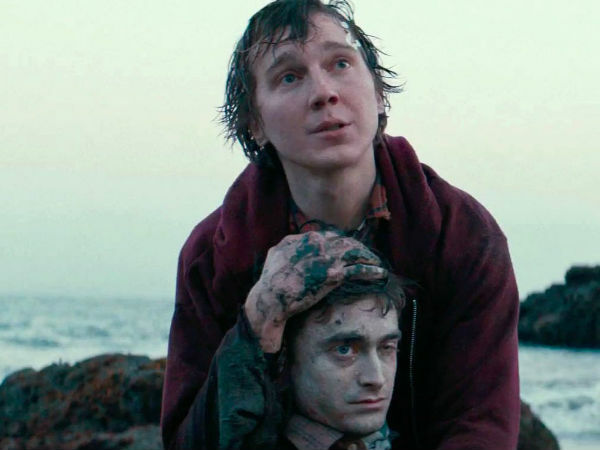 Radcliffe is irresistible as Manny, a role that must have been terribly uncomfortable to play (many scenes see him lying completely still as ice cold water rushes over him). There’s a disarming, magnetic quality to the Harry Potter star’s eyes that’s pretty extraordinary, and it’s a gift that’s put to good use in an almost exclusively immobile role such as this one. Dano’s a marvel as well and, without spoiling anything, puts forth one of the most ravishing, tender performances of his career. The film’s production design is impressive too, marrying practical effects with well-hidden digital trickery to create a world that feels handmade, roughed-up and textural. Daniels’ use of lighting can be quite magical; at one point, Hank makes a city bus out of garbage to jog Manny’s memory of the real world, and there’s a tight shot of Radcliffe staring out of the “window” as paper scenery rolls by via hand crank that, once you get lost in it, looks unmistakably like the actor is sitting on an actual bus, passing a Starbucks on his way to work. It’s a stunning use of lighting, composition and set design. Swiss Army Man is an absolutely bonkers story full of abstract, dreamlike imagery á la Michel Gondry or Stephen Chow, but there’s an ocean of intermingling themes, ideas and emotions swirling throughout. It’s a road movie, romantic comedy, arthouse experiment, midnight movie and so much more, smashed elegantly together in a single, inimitable package. What the film is about at its core is the weight of shame holding us back from being who we really are and finding true love. According to Manny, farting in public is a virtue. Who knew poop jokes could be so good for the soul?